Week 3: How do you study the Bible? Today, we’re are continuing on in our series HOW DO YOU STUDY THE BIBLE?. As much as I love a good Bible study book or devotional, we can (and should) be able to open the Bible and study it for ourselves. “The Bible wasn’t written for a few experts to understand while baffling the rest of us.” (Angie Smith, Seamless) It was written for me. It was written for you. Not only that, but God is faithful. Forget about your own ability or lack there-of when you open these sacred pages. Trust that God can teach you. Trust that you can be God-taught. This third approach gives us the opportunity to dig in a little bit more by leading us through 5 P’s. This method has quickly become my favorite way to study the Scriptures for myself. Here’s how I would use 5 p Method. 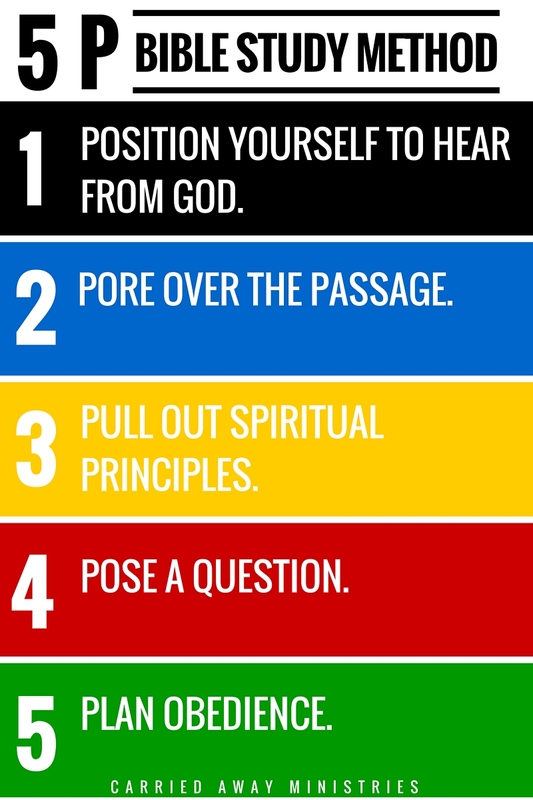 1: Position yourself to hear from God. When I first learned this approach, I thought, “Why didn’t they call this first “P” pray?” However, as I’ve been practicing, I’ve realized that there is more to positioning yourself to hear from God than “just praying”. 2: Pore over the passage. First, I read the pass one time through, acquainting myself with text. Now I read the text again, this time looking specifically for the who, what, when, where and why of the passage. Write these down. What: Old man told Mary and Joseph who Jesus would become. Why: Mary and Joseph did this to fulfill the Law. The Holy Spirit promised Simeon that he would not die until he saw the Christ. This was his promise fulfilled. 3: Pull out spiritual principles. Now I’m looking to pull out the meat from the text. What can I learn from what I’ve read? Simeon was given a promise, then was prompted to move. Through obedience, he received his promise from the Lord. God is faithful to His promises! There is no middle ground in our response to Jesus. “Some will fall, others will rise”. Hearts will be revealed. He will be rejected by many. This would break Mary’s heart. Next I want to create questions based on the principles I learned. Are you spiritually awake enough to hear (recognize) a prompting from God? When He prompts, do you move in faith? Do you ever discriminate when spreading the message of Jesus? Lastly, I write down how I’m going to obey (or put into practice) what I’ve read. Slow down and get quiet enough to hear from God. When you hear, move! Quit making assumptions about people. Pour our your life generously to all! Now it’s your turn to practice. Start with the same passage as my example: Luke 2:25-35. This approach has become my favorite because allows me to focus on the details without getting too lost in them. It doesn’t take me long to complete, but when I’m finished I have a good understanding of the text and have found ways to apply it to my life. So, what do you think? Is this an approach that is do-able for you too? Our last approach, Method #4, is coming next week. Until then, practice, practice, practice! Sign-up for my blog updates and never miss a post. I'll send you 7 Simple Tips for Memorizing Scripture as a THANK YOU. « Week 2: How do you study the Bible? 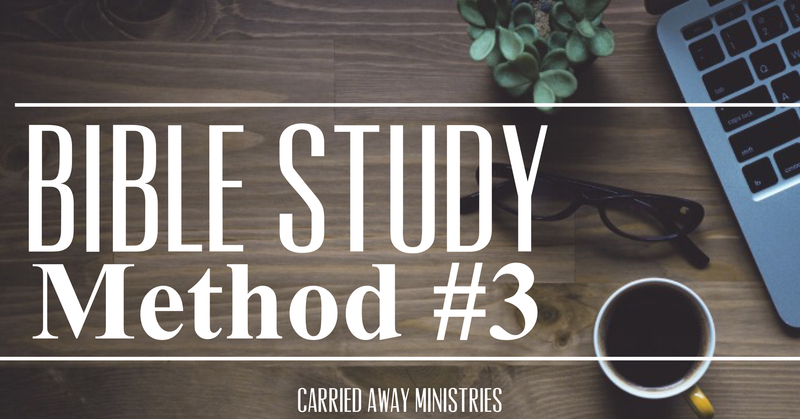 Thank you for demonstrating each type of Bible study. That’s so helpful! Again, thank you so much! I’m so glad these posts have been helpful to you, Linda. Blessings!! Need a little help with Scripture Memory? 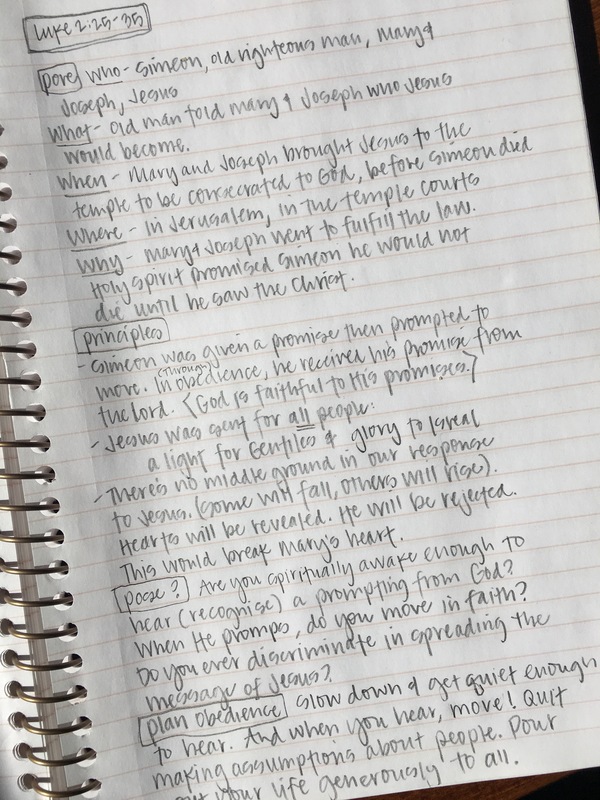 Subscribe to the blog and I'll send you 7 Simple Tips for Memorizing Scripture as a thank you.